The first quarter of 2019 has officially surpassed the first quarter of 2018 with 21,200 invitations to apply for permanent residence issued to candidates in Canada’s Express Entry system. This is a 3,700 increase from 2018’s first quarter that ended at 17,500 invitations issued. The year 2018 set an all-time record of 89,800 Invitations to Apply (ITAs) issued. This is the highest number of invitations issued for any one year since Express Entry was introduced in 2015. This year is expected to be an even bigger year based on Canada’s three-year immigration levels plan. The plan outlines rising annual admission targets for the years ahead, culminating in 350,000 admissions in 2021. The increasing admission targets for 2019 and 2020 could mean the total number of invitations issued in 2019 may exceed the ITA record set in 2018. The Canadian government utilizes the Express Entry system to select permanent immigration candidates from a pool of potential candidates who are eligible under one of the Federal High Skilled economic immigration programs — the Federal Skilled Worker Program, Federal Skilled Trades Program or the Canadian Experience Class. Express Entry profiles are assessed on ‘core human capital’, skill-transferability and additional factors. Profiles are assigned what is officially called a Comprehensive Ranking System (CRS) score. This score, out a maximum of 1,200 points, determines a candidate’s rank in the Express Entry pool. The Government of Canada regularly conducts draws from the pool of eligible candidates where the highest-ranked are invited to apply for Canadian permanent residence. 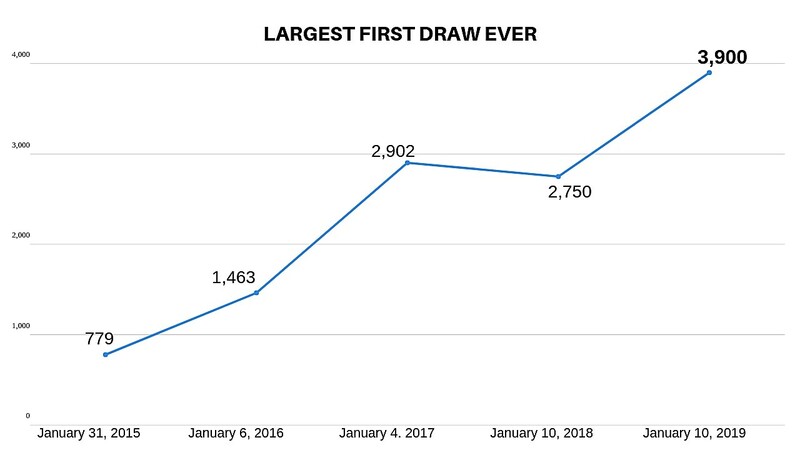 This year began in full swing with the largest-ever first draw of a year since the Express Entry system was introduced four years ago. When comparing the total number of Express Entry ITAs issued in the initial quarter of 2018 and 2019, it is evident that the first quarter of this year beat last year in terms of ITAs issued. However, in 2017, the federal government issued the most ITAs for a first quarter with a total 86,023 ITAs issued for the year. This number was eventually surpassed with 89,800 ITAs issued in 2018 and is expected be outperformed again this year. 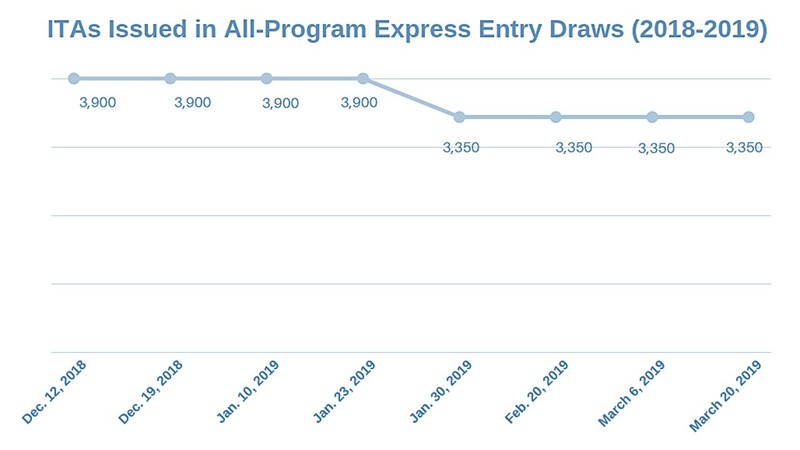 So far this year, Express Entry draw sizes were set at 3,350 ITAs for four out of the six Express Entry draws with the exception of the first two draws when 3,900 ITAs were issued in both occasions. 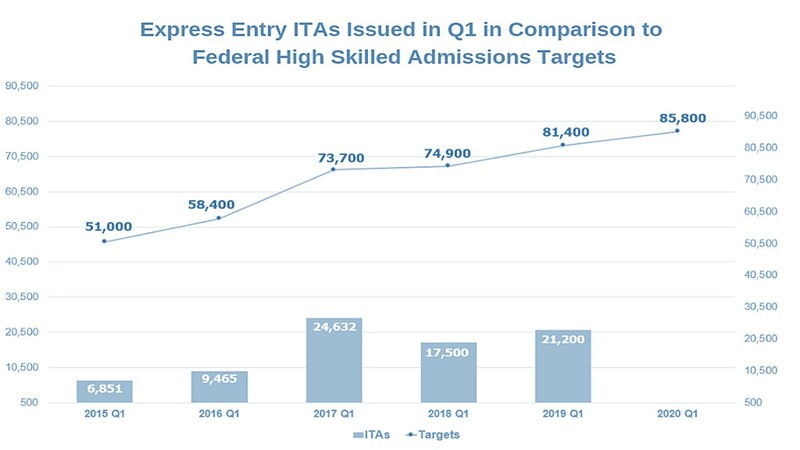 The chart above illustrates the number of ITAs issued in the first quarter of each year versus Federal High Skilled economic immigration admissions targets. These targets represent the number of highly skilled foreign nationals admitted as Federal Skilled Workers, Federal Skilled Trades and Canadian Experience Class applicants. It remains to be seen which parts of the year will be busiest, as the Government of Canada works toward meeting its Federal High Skilled economic admissions target of 81,400 for 2019 and 85,800 for 2020. 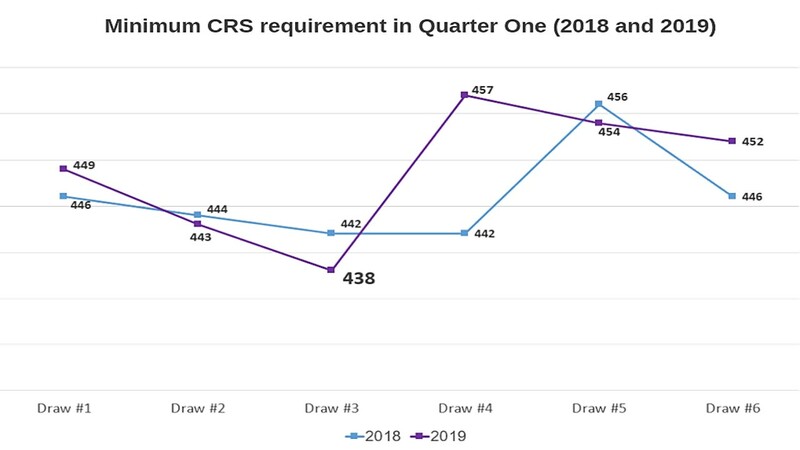 In the first quarter of this year, the minimum CRS score requirement dropped as low as 438, which is its lowest cut-off for an all-program draw since the final quarter of 2017 when the CRS fell to 436. The minimum CRS score is the score that a candidate must satisfy in order to be invited to apply for permanent residence during a given draw. All candidates in the Express Entry pool with scores above this cut-off are drawn and are issued invitations to apply for permanent residence. A score of 438 is the second lowest minimum CRS requirement for a first quarter of a year. The lowest recorded CRS for a first quarter was 434 in 2017. That year also holds the record for the lowest minimum CRS ever recorded in an all-program draw which occurred on May 31, 2017, when the minimum CRS dropped to 413. This first quarter ended with the minimum required CRS score dropping two points, to 452. This was a 5-point reduction from the highest point it reached during the first quarter. Looking at recent draws, the time between draws can influence the minimum CRS requirement. Less time between draw means less profiles are submitted into the Express Entry system. This could result in less high-scoring candidates entering the pool, which may have the effect of lowering the cut-off score at the time of a draw. On two separate occasions —January 10 and February 20 — the time between draws was more than 20 days. In both events, the CRS threshold increased in comparison to the former draw. However, in the two most recent draws that occurred within the regular two-week interval, the CRS score decreased. This trend is captured in the chart below. Another trend that coincides with the changing CRS score is draw size. In the last four Express Entry draws, the ITA total was 3,350. This number represents a 550 ITA decrease from the larger draw size of 3,900 ITAs in late 2018 and early 2019. The draw sizes for the first two draws of 2019 were both the largest ever for a first quarter. Draw sizes may increase again over the course of 2019 as Immigration, Refugees and Citizenship Canada (IRCC), the Government of Canada’s division responsible for Canadian immigration matters, works to reach the admissions target for 2019. If IRCC moves toward possible larger or more frequent draws, we may also witness a more dynamic – or even reduced – minimum CRS requirement in upcoming quarters. Canadian provinces have been exceptionally busy in the first quarter of the year with Ontario, Manitoba, Saskatchewan and other provinces using their Provincial Nominee Programs to select Express Entry candidates through dedicated streams. A nomination from a Canadian province or territory results in an Express Entry candidate being awarded an additional 600 CRS points and puts them in a favourable position to receive an ITA. Similar to Federal High Skilled admission targets, PNP targets are set to rise annually in Canada’s three-year immigration levels plan. The PNP admission target for this year is 61,000. By 2021, the PNP target will account for 71,300 admissions. In the first quarter of 2019, Ontario’s popular Human Capital Priorities (HCP) Stream held its largest draw ever with 1,493 Notifications of Interest issued to Express Entry candidates who had CRS scores between 439 and 448. To select candidates, the Ontario Immigrant Nominee Program (OINP) searches the Express Entry pool for candidates who meet the eligibility criteria of the HCP or any other Ontario Express Entry stream — French-Speaking Skilled Worker Stream or Skilled Trades Stream. The Nova Scotia Nominee Program (NSNP), which has three Express Entry-aligned streams, held two draws in the first quarter through its Nova Scotia Labour Market Priorities Stream. In its first draw in January, the passive stream targeted financial auditors and accountants with CRS scores between 400 and 450. The second draw held March 20 prioritized Express Entry candidates who listed French as their first official language. Other provinces like Saskatchewan, Manitoba, and Prince Edward Island have been publicly announcing draws through their unique Express Entry-aligned immigration streams. The Saskatchewan Immigrant Nominee Program (SINP) held three Express Entry draws with a cumulative 515 invitations issued to Express Entry candidates registered in the province’s unique Expression of Interest (EOI) pool. Are you currently in the Express Entry pool? 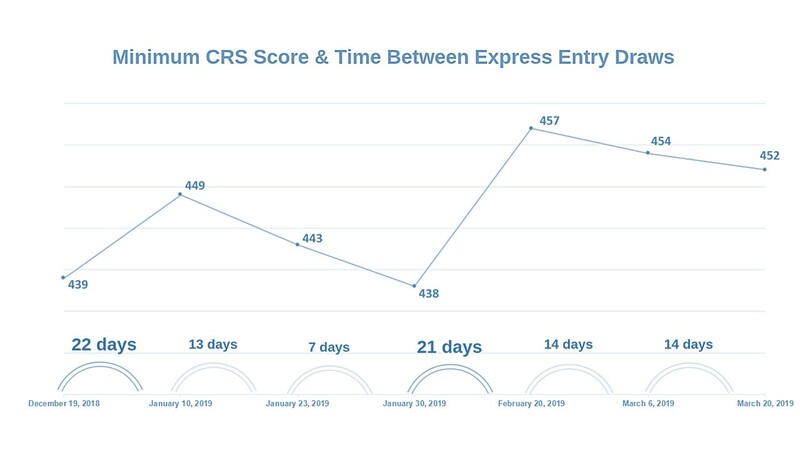 Visit our dedicated page to learn ways to improve your CRS score and ranking in the Express Entry candidate pool.